I’ve previously highlighted the gorgeous soundtrack of Xenoblade Chronicles, and this week, I’ve returned for a second helping. “Hometown” is the epitome of RPG town music – peaceful, happy, and pleasant. Like most of the game’s ambient songs, it comes in two versions — a more energetic one that plays during the in-game daytime; and a gentler one that plays at night. I’ve linked both below the cut. Enjoy! Of all the magic woven by storytellers, immersion has to be one of the most precious threads. How wonderful it is that we can pick up a book, or play a game, or sit in a cinema, and be transported into another world! The people who write bullet points for video game boxes know this, which is why “immersive” is one of their favourite buzzwords. So is “visceral”, which I find telling. To be immersive, it seems, a work should have us on the edge of our seats: tense, excited, ready to feel its characters’ pain as if it were our own. But there’s also another kind of immersion – think of the proverbial warm soak. An immersive world can be utterly relaxing, an invitation for us to kick back and lose ourselves for an hour or two. Nearly 20 hours into Xenoblade Chronicles, I can say it exemplifies the latter. 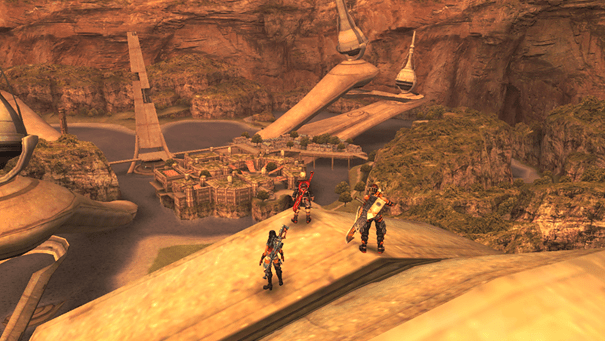 Xenoblade is an RPG for the Nintendo Wii – a platform exclusive, as a matter of fact. It’s a party-based JRPG that bears a striking similarity to 2006’s Final Fantasy XII, in that there are no random encounters and no distinction between an overworld, area maps, and combat screens. Rather, like a Western RPG, monsters are clearly visible – and combat takes place – in the field. Combat is real-time, and the player only controls one party member at a time, chosen before battle starts; the rest of the party is controlled by a generally competent AI. Since the chosen character will auto-attack enemies, the player’s job is to manage aggro, special abilities, and cooldowns. (Not items; there are no potions, stimpacks, antidotes, or the like in this game.) I’ve heard this compared to MMO gameplay, and it’s certainly different from what I’m used to. This week’s theme is a piece of ambient music from the Wii’s flagship RPG, Xenoblade Chronicles. Like the area in which it plays (depicted in the concept art below), it has an otherworldly loveliness that actually made me halt what I was doing in the game, sit back, and drink in the experience for a couple of minutes. Enjoy!